We have an orchard! Well, actually, we appear to have a field of sticks tied to other sticks, but in my imagination they're just oozing with potential. In my plans for the orchard planting work I pictured Mike digging the holes with the tractor and me planting the trees. Easy, right? Er, no. I failed to factor in the physical effort involved in filling the holes in again, which obviously (I now realise), you can't use the brute force of the tractor for. It was stupendously hard work. 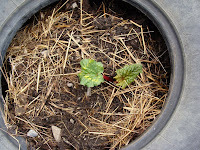 By about the third tree I was wondering if planting an orchard had been such a brilliant plan, after all. Things got a bit better once Mike had finished digging the holes (by which time I'd planted nine out of the 17 trees), because then he was able to help with the filling-in (he's got the shoulders for this kind of work - I'm built more like the spindly apple trees). It took five hours to get all the trees in the ground, staked, pruned and watered. The staking was a good bit of recycling: the stakes are bits of wood that were lying around the farm (some old fence posts, others branches from the poplars we had cut down last year) and I made the ties holding the trees to the stakes from an old pillowcase (Canadian pillows are bigger than UK ones, so I figured it was unlikely I'd need the pillowcase again). By the time we'd finished we were exhausted, but very pleased with ourselves. Then we were rewarded with seven hours of steady rain, which should have soaked the trees in well. I've also been busy rescuing tulip bulbs. 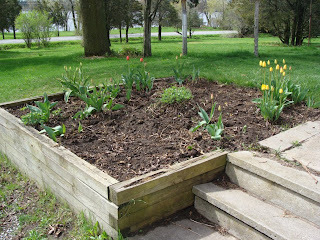 Last summer the black squirrels took great pleasure in digging up the tulips and redistributing them all over the lawn. 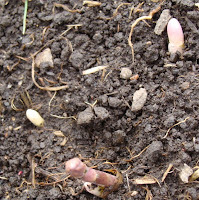 So far I've dug up about twenty bulbs (luckily the squirrels plant them very shallowly, so this isn't too difficult). 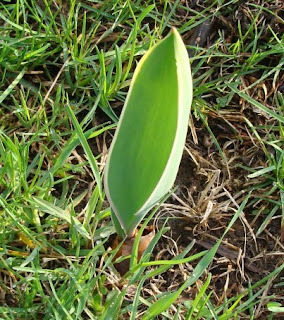 They did the same thing to one of our neighbours' tulips, but replanted them in someone else's lawn. I wonder what the etiquette is concerning rescuing one's own tulips from a third party's garden?